I have a couple of sheep themed lunches to post, but I just found out that today is pancake day and I decided to post this pancake bento first. 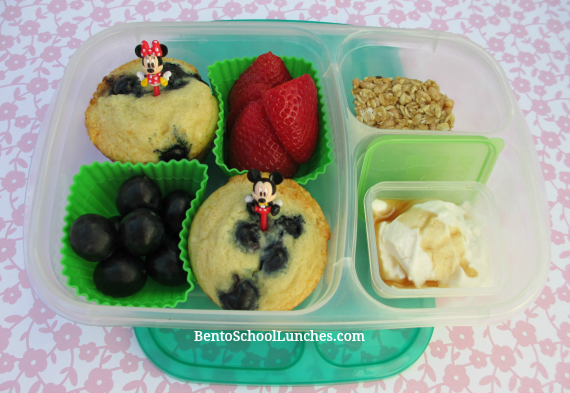 We love muffins at anytime of the day and we are also huge fans of breakfast for lunch. I love the idea of baking several batches at a time and freezing the extras for super busy mornings, when we need a grab and go.These particular ones were baked yesterday and I've left some out for the next morning, the rest went into the freezer. As I have promised earlier to share the recipe, scroll down and you'll find it. This recipe is one of our longtime family favorites. There are so simple to make, you get the ease of a muffin with the deliciousness of a pancake. There are gazillions of yummy pancake recipes out there but this one works for me, it's simple and I mostly have the ingredients on hand. I usually add frozen organic blueberries, strawberries and chocolate chips. You can also use bacon, ham and sausage pieces if you prefer adding meat. Here is the recipe which I added blueberries. 2 cups Original Bisquick mix or any other brand that you prefer. In medium bowl, stir together pancake mix and remaining ingredients (except blueberries) until moistened. Do not over-mix. Spoon batter into greased or paper lined muffin pan, filling ¾ full. Add blueberries in each cup leaving space in between them. Easy right? I included a couple of them with super cute Mickey and Minnie picks, in Nikolai's Easylunchboxes. He also had strawberries, seedless black grapes, granola bar cut into half and Greek yogurt with pure maple syrup in his leakproof mini-dipper. I also made a batch the other day with heart shaped strawberries and you can find one which I included in Nikolai's school lunch here. Yummy! My family love pancakes and I have to give your recipe a try! That looks yummy! Thanks for sharing the recipe! Thank you so much Midori! Thank you so much Yenny! Thanks for the recipe! Looks so yummy!